There’s a growing list of amazing apps for ChromeOS which is increasingly making it easier to use a Chromebook as your day to day device. 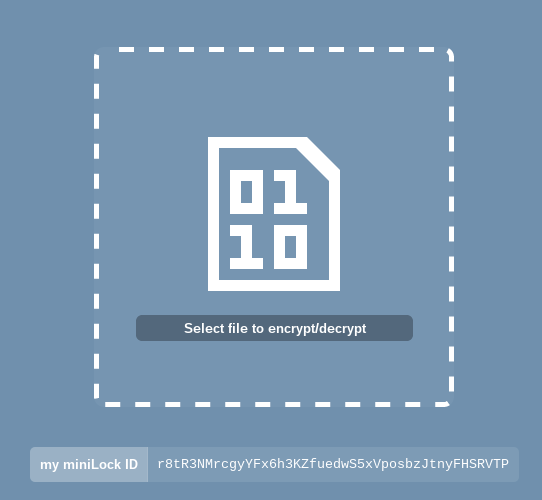 Today sees the release of MiniLock, a new file encryption app. MiniLock, created by Nadim Kobeissi, encrypts single files ready to be sent to other users. The only requirement is that, as a Chrome App, both ends need to be running Chrome or ChromeOS. Hardly a deal breaker now-a-days. Here’s a quick guide to how to encrypt a file with MiniLock. When you start MiniLock you will be prompted for your email address and secure passphrase. The passphrase has to be long, really long. I struggled to come up with enough words to meet the requirements and you’ll definitely want to keep the passphrase safe. If your passphrase isn’t long enough one will be suggested for you. Click the arrow when you are ready. Next up you will need to choose the file to be encrypted. Here I’m choosing my super secret screenshot of secret stuff. You will also see your MiniLock ID. Keep this safe as well. This ID needs to be given out to other people so that they can encrypt files just for you. On the next screen you can enter the recipients MiniLock ID. This will ensures that the file is only accessible by you and the person you are sending the file to. You will also get the option to change the filename to a random string. Useful for keeping my super secret screenshot safe. Click the arrow. Finally you can download the encrypted file. Once you have downloaded the file you can see that encrypted file has a .minilock extension. Send this file securely. To decrypt at the other end the user runs MiniLock as above but chooses the .minilock file on the file selection screen. If his MiniLock ID matches one of the ones you used when you encrypted it, they’re good to go.